Former Morgan Stanley analyst and current Kleiner Perkins investor Mary Meeker delivered her annual State of the Internet presentation during the Code Conference earlier today. Her reports are deemed by many as an excellent indicator of what’s happening right now online and how it fits into the bigger overall picture. The 164-page slideshow has been put online and fortunately, Quartz has a nice summary of some of the key highlights. According to the report, Internet user growth and smartphone growth has slowed although mobile data traffic is up 81 percent year over year thanks largely to streaming video content. As it stands, 22 percent of streaming video is now consumed over mobile devices. 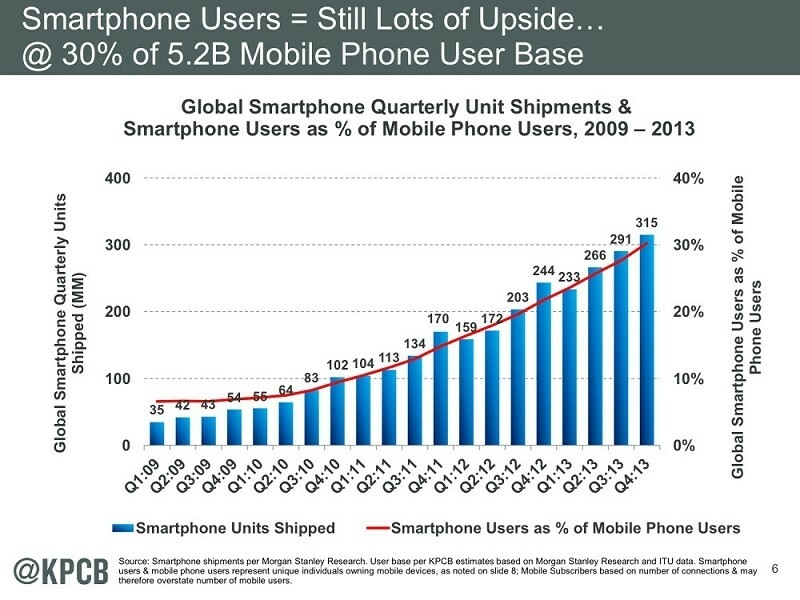 Despite the slowdown, however, the global smartphone market isn’t even close to being saturated. Only 30 percent of the world’s mobile phone users own a smartphone. And interestingly enough, there are still more global TV users than mobile phone users (5.5 billion versus 5.2 billion). The report touches on a number of other random topics as well. For example, Meeker claims there are around 5 million Bitcoin wallets in existence which is up more than eight times compared to the year-ago period. We also learned that US residents love to multitask. Two-thirds of tablet owners reportedly surf the web while watching TV and 44 percent of them are shopping. Again, the entire report is now online if you’re looking to dig a bit deeper into current web trends.